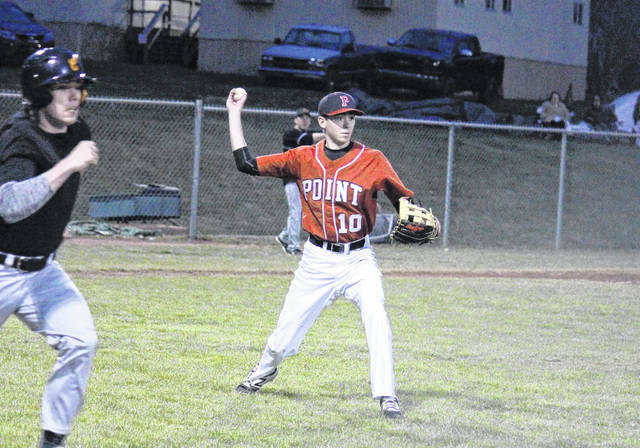 PPHS junior Sam Pinkerton (10) throws out a runner on his way to first base, during Chapmanville’s 7-1 win on Monday in Point Pleasant, W.Va.
POINT PLEASANT, W.Va. — You win some, you lose some. 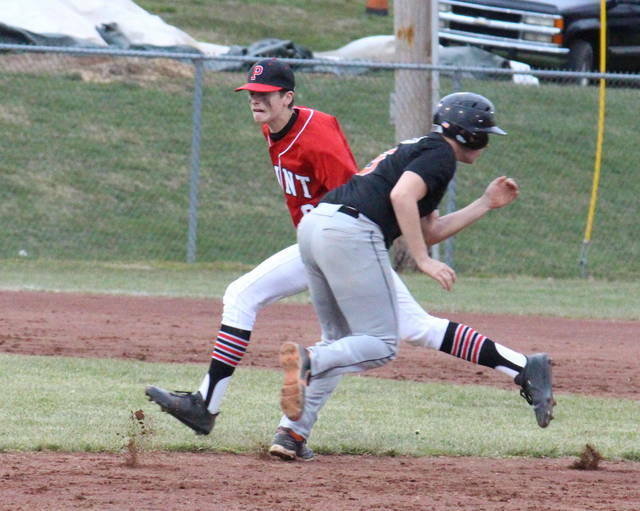 The Point Pleasant baseball team has now done both this season, as non-conference guest Chapmanville handed the Big Blacks their first setback by a 7-1 tally on Monday in Mason County. Chapmanville (1-0) broke the scoreless tie in the top of the first inning, as Noah Dingess hit a solo home run. Two innings later, Dingess doubled and later scored on an Adam Vance sacrifice fly, giving CHS a 2-0 lead. Chase Berry drove in Dingess in the fifth inning, stretching Chapmanville’s lead to 3-0. The Tigers broke the game open with four runs on three hits, one walk and one error in the top of the sixth inning. 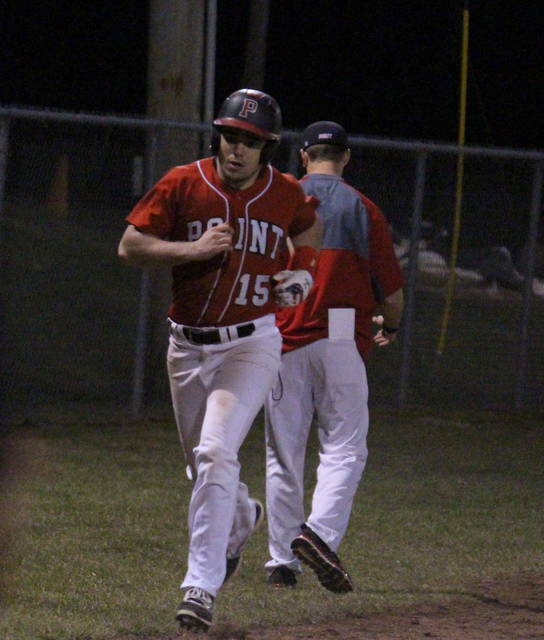 After stranding five runners in scoring position in the first five innings, Point Pleasant (1-1) finally broke through in the bottom of the sixth, as senior Tucker Mayes blasted a solo home run to start the frame. The Big Blacks had just one more base runner in the game and fell by a 7-1 final. Conner Mullins was the winning pitcher of record for the Tigers. Suffering the setback for the Big Blacks was Joe Herdman, who struck out four batters in 3.1 innings and allowed two runs, five hits, and two walks. 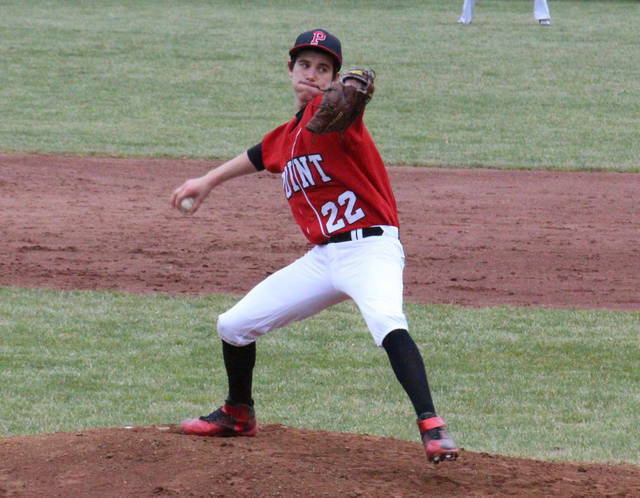 In relief for PPHS, Sam Pinkerton struck out two batters and gave up three runs, while Brody Jeffers surrendered two runs. Joel Beattie finished the game on the hill for PPHS and struck out one batter. Mayes went 1-for-3 with a home run to lead the Big Blacks at the plate, while Pinkerton, Miles Williams and Carter Smith each singled once in the contest. Dingess led the victors with a 4-for-4 day, that included a triple, two doubles and four runs scored. Josh Zigmond and Trenton Short each had two hits, with Short scoring once, while J.D. Ferrell and Conner Mullins both singled once and scored once. Both teams left eight runners on base and committed four errors in the contest. The Big Blacks end their three-game homestand on Wednesday, when Ripley visits Mason County. PPHS will compete at Chapmanville’s tournament on April 6 and 7.